Heat 12-inch nonstick skillet over medium-high heat. Cook pork in skillet about 5 minutes, turning once, until brown. Add broth, potatoes, carrots and onions to skillet. Sprinkle with salt and pepper. Heat to boiling; reduce heat. Cover and simmer about 30 minutes or until vegetables are tender and pork is no longer pink when cut near bone. Sprinkle with parsley. 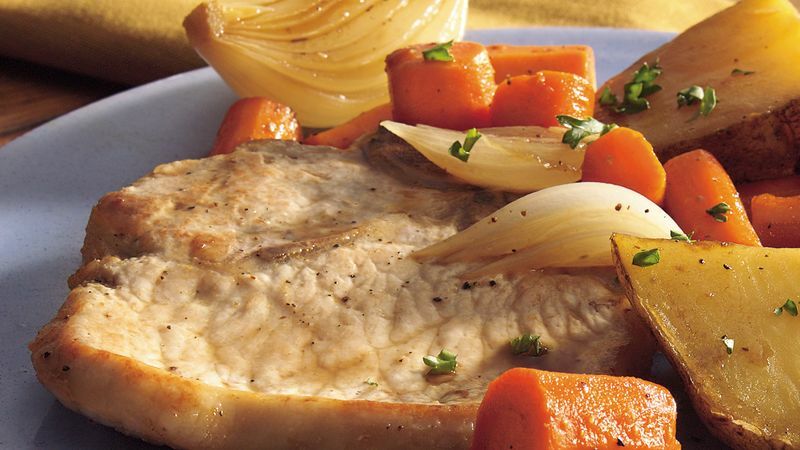 Not only do the potatoes, carrots and onions in this recipe fill you up, they add important nutrients such as fiber, vitamin A and vitamin C.